William Brumfield, an American professor and historian of Russian architecture, has received the Likhachev Foundation Prize "for outstanding contributions to the preservation of the historic and cultural heritage of Russia.” RBTH reports. American professor of Slavic studies and historian of Russian architecture William Brumfield has been awarded the Dmitry Sergeyevich Likhachev Foundation Prize "for outstanding contributions to the preservation of the historic and cultural heritage of Russia". The ceremony was held in the splendid main hall of the St. Petersburg’s Kochubei Mansion on Nov. 28. "To receive the Likhachev Prize is an extraordinary honor, one of the highest that Russia offers in the area of culture,” said Brumfield on receiving the award. Brumfield, who has spent more than 10 years in the Soviet Union and Russia, also noted “the generous cooperation” he had “consistently received from Russian colleagues,” adding that they had “greatly enhanced” his ability to share the years of research and field work he had done in Russia. “I am proud that my work is now linked with the name of Dmitry Likhachev," he said. Professor of Slavic Studies at Tulane University (New Orleans), William Brumfield is a historian specializing in Russian architecture, a photographer, a tireless defender of monuments, and the author of 35 books and dozens of articles on the problems of preserving the architecture of Russia, primarily in the Russian north. He is also a regular contributor to Russia Beyond the Headlines. The award was established by the Dmitry Likhachev Foundation and the St. Petersburg government in 2006, in honor of the 100-year anniversary of the birth of the outstanding scientist and public figure. The prize is awarded for selfless activity in the preservation of monuments of history and culture; the preservation of museum, library and archival collections; development of the local history movement in Russia, and the promotion of the historical and cultural heritage of Russia. The Dmitry Likhachev Foundation Prize has become a sign of public recognition and a prestigious award in its field. 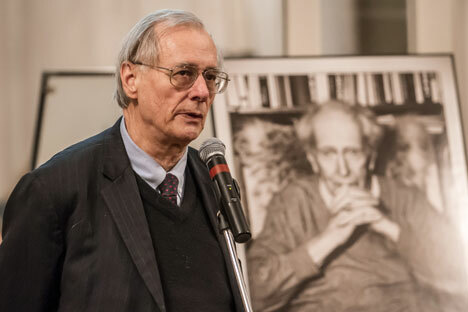 Other recipients of the Likhachev Foundation Prize this year were: director Alexander Sokurov; archaeologist Oleg Ioannisyan; Lyudmila Maximova, director of the local history museum in Nevel, Pskov Region; Vasily Khanevich, a Tomsk-based specialist of the history of Soviet political repressions; Yelena Tsvetkova, head of the library in Komarovo, in the Leningrad Region. William Brumfield’s special RBTH section Discovering Russia shows the most beautiful and remote corners of old Russia: the wooden churches of the north, the abandoned villages of central Russia, and historic sites near Moscow and St. Petersburg.